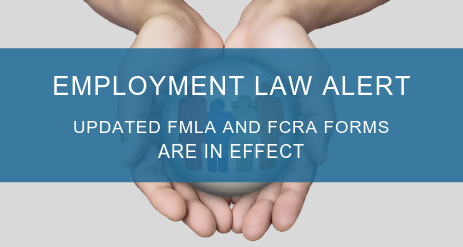 The U.S. Department of Labor (DOL) recently extended the validity of its online notices and medical certification forms for use in connection with leaves of absence under the Federal Family and Medical Leave Act (FMLA) until August 31, 2021. There are no substantive changes to the forms. The updated forms are nearly identical to the previous forms, except for adding the new expiration date to the top-right corner of forms. Despite the substantive similarities, you should start using the new forms immediately because the old forms have expired. On September 21, 2018, the Consumer Financial Protection Bureau’s (CFPB) interim final rule updating the model disclosure forms required under the federal Fair Credit Reporting Act (FCRA) went into effect. Employers must begin using the updated model disclosure forms in connection with background checks for job applicants or employees. The Summary of Consumer Rights and Summary of Consumer Identity Theft Rights forms were updated to reflect changes based on a recently enacted law titled the Economic Growth, Regulatory Relief and Consumer Protection Act. The updated forms outline consumers’ right to obtain a free “security freeze.” A security freeze prohibits consumer reporting agencies from releasing the contents of a consumer report without the consumer’s authorization. Alternatively, consumers have the right to an initial or extended fraud alert free of cost. The updated forms also reflect the time frame extension from 90 days to one year for the minimum duration of an initial fraud alert. Employers can comply with the interim final rule by either using the updated Summary of Consumer Rights form or by including a summary of the new security freeze rights with the transmittal of the previous model disclosure forms. The updated Summary of Consumer Rights can be found here. The updated Summary of Consumer Identity Theft Rights can be found here. If you obtained an FCRA packet from us and want help updating it with the new forms, or if you have any questions regarding the FCRA or the updated forms, please contact us.